Gretta was born December 15, 2011. 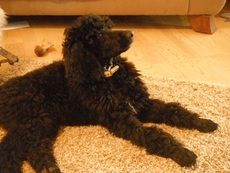 She is a young Standard Poodle sired by Bobzien's Irish Creme, a.k.a. Jake, and out of Miley, a black and white parti-colored Standard Poodle. Gretta is spending her time playing and being a goofy big house dog. She is learning to retrieve and Gretta may be joining Jon's hunting dog, Buddy, as she learns more. We just love having her in the house with her big ol' plunky feet plopping around our hardwood floor. When she is tired, she flops down like someone shot her legs out from under her. She is truly a fun, fun dog. Plans are for Gretta to potentially join our mommas in 2013.